Soviet tanks were one of the last century’s greatest martial success stories. From their effectiveness in border skirmishes with the Japanese to the mortal blow they inflicted on the Third Reich at the Battle of Kursk, tanks underpinned Soviet military victories throughout the 20th century, and also saw widespread use by other countries around the world. The MS-1, T-18 was the first mass-produced Soviet tank. A total of 960 units were produced in all. The MS-1 first saw action during the Sino-Soviet conflict of 1929, when a nine-tank attack immediately overwhelmed the Chinese infantry. In the mid-1930s and beginning of the 1940s a significant portion of these machines were used as emplacements on territories bordering the Far East and the Karelian Isthmus along the Finnish frontier. Occasionally, the MS-1 is mentioned in the annals of World War II. Today there are no fewer than 10 MS-1s standing as monuments or museum exhibits around Russia. The BТ-7 was a high-speed tank that made its debut during the battle against Japanese troops near Lake Khasan (on Russia’s border with North Korea and China) in the summer of 1938. However, the BТ-7s were more spectacular in action against the Japanese Empire the following year in Mongolia during the Battles of Khalkhin Gol, where the steppes witnessed the tank's swiftness and maneuverability. At the beginning of WWII, the BТ-7, in terms of its fighting qualities, was as good as most German tanks and was used until the middle of 1942. The epilogue in the BТ-7's biography was the Soviet-Japanese War in August-September 1945, when these ageing tanks made up the second battalions of the tank regiments and ran behind the more powerful T-34 and JS-2 (ИС-2). The T-34/76 is one of the best medium-class tanks of its time. It was well-armored and had excellent firepower. At least until the middle of 1942, the enemy had little to counter it with. Even when hit, the T-34 would often remain active on the battlefield. When the enemy brought out heavy and modernized machines in 1943, the T-34 was also transformed. Its armor was strengthened, a fifth crewmember was added and its new 85-mm gun could now destroy just about any German tank at close or middle range. In March 1944 the T-34/85s started rolling out to the front. Although the T-34 was not an ideal tank, it was easy to make and master, and became the world's most produced tank. It was used right up to the 1990s, when it featured in the civil wars in the former Yugoslavia. The KV-1 was a heavy Soviet tank. They were first used during the last week of the Winter War between the Soviet Union and Finland in 1939-40. In 1941 the KV was considered one of the most powerful tanks in the world. According to one German document, the vehicle was practically unbeatable: “You couldn't go around it; it was surrounded by boggy ground. The attempt to destroy the tank with a 50-millimeter antitank battery at a distance of 500 meters led to heavy losses in calculations and artillery." The tank in question remained operative, even though it had been hit 14 times, and sustained only dents in its armor. The majority of KVs were lost not in battle, but due to technical breakdowns and insufficient fuel. At the end of 1943 the KVs were replaced by the heavy JS tanks. The IS-2 was also a heavy tank, just like its predecessor, the KV-1. It was created to smash heavily fortified enemy positions and combat heavy tanks. In a well-publicized incident during the Lvov-Sandomierz Offensive (a Red Army assault on western Ukraine in July 1944), two besieged JS-2s obliterated 17 German tanks and self-propelled guns. The IS-2 became an irreplaceable tool for penetrating enemy defenses especially on the way to Berlin and Konigsberg (modern-day Kaliningrad). After the war, the tank was modernized and remained in use until 1995. The T-54 was created based on the experience of WWII and was to become a central participant in military conflicts in the second half of the 20th century. The T-54 and its later model, the T-55 (which offered protection from nuclear assault), were used in Hungary in 1956, Czechoslovakia in 1968, in Vietnam and in wars in the Far and Middle East up to the beginning of the 21st century. One of the last conflicts in which the T-55 was used was in the Russo-Georgian War of 2008, in which it was employed against Georgian forces by the Russian-backed South Ossetian Republic. A main battle tank, the T-72 went into production in 1973. Starting with the Lebanese conflict in 1982, the T-72 was actively used in wars in the Middle East and in the former USSR. 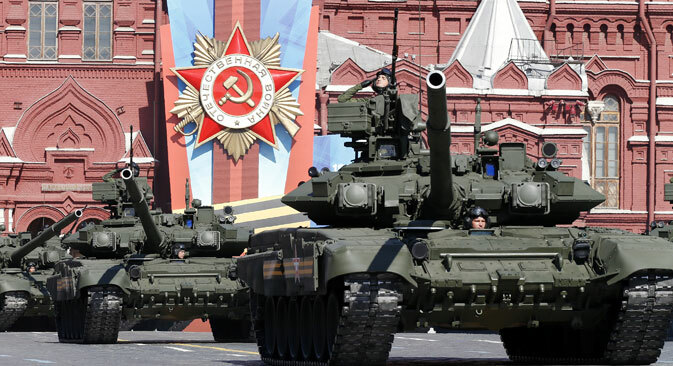 The T-72 is the most popular Soviet-era tank and has been used by almost forty countries around the world.